with the response times of the Binary Defense SOC"
Stay informed of daily cybersecurity news and events with Threat Watch by Binary Defense, delivered straight to your inbox! On average, a data breach can take 6 months to detect and can cost your business up to $8 million. Don’t wait until it’s too late! Protect your company’s most valuable assets with network monitoring that is people driven and technology assisted. Our Security Operations Center (SOC) team will detect and analyze advanced attack patterns and alert you of any malicious threats as soon as they are identified. Protect your business from harm caused by cyber-attacks with our Endpoint Detection and Response (EDR) technology. You can’t stop adversaries from targeting your organization, but you can at least ensure that your team is prepared when threats do arise. Our intelligence specialists use advanced techniques and custom developed applications to proactively identify threats to your business. Our security researchers are constantly working to reverse engineer newly identified threats, so you are ready for incoming attacks before they happen, not after. Binary Defense was founded with the purpose to change the security industry for the better and help organizations defend against threats of all kinds. I recently had a chance to come up against Binary Defense Vision on an engagement. 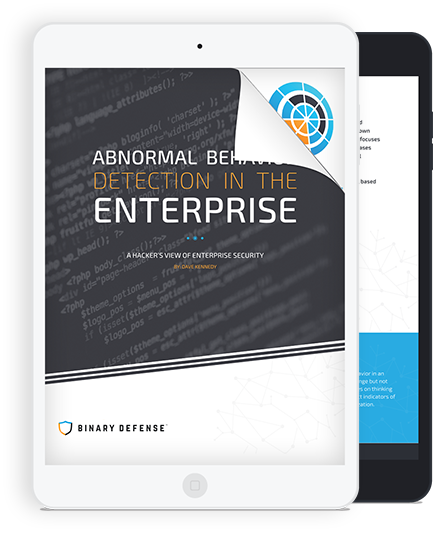 This was a collaborative engagement to help the customer improve defenses and detections, so I got to see the kind of visibility that Binary Defense offers to Vision customers. I was amazed at the level of detail captured by Vision. I was blown away by the response times of the Vision SOC staff. I couldn’t believe it when I found out the Binary Defense SOC had alerted my customer within two minutes of getting a beacon established. I cut my teeth in the blue team world before moving over to red. I haven’t seen another product that combines the visibility that Vision offers with the response times of the Vision SOC. I’m excited to see what Vision offers and how it’s progressing, but I’m definitely not looking forward to encountering it on another engagement! Most enterprises struggle with the ability to detect attack vectors that are designed to evade most enterprise defenses. The shifting tactics of the attackers are troublesome for most companies due to the nature of how the attacks work and the inability to change dynamically with the attack vectors. Binary Defense was founded with the purpose to change the security industry for the better and help organizations defend against threats of all kinds. Built from the minds of the industry’s top security researchers and continuously evolving to detect next-generation threats, Binary Defense is your company’s security solution.